Campbell, Karlyn Kohrs; Huxman, Suszn Schultz; Burkholder, Thomas A. 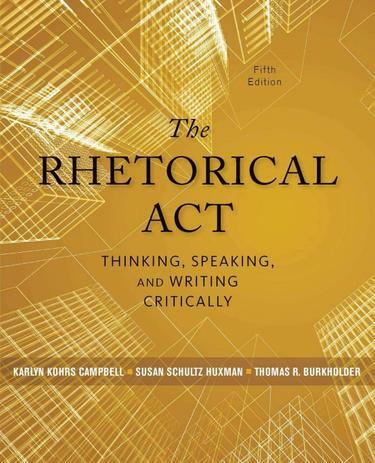 THE RHETORICAL ACT: THINKING, SPEAKING, AND WRITING CRITICALLY, Fifth Edition, teaches liberal arts students how to craft and critique rhetorical messages that influence, inviting and enabling them to become articulate rhetors and critics of the world around them. The new edition maintains a traditional humanistic approach to rhetoric, while extending the scope and relevance of the text. THE RHETORICAL ACT reaffirms the ancient Aristotelian and Ciceronian relationships between art and practice-one cannot master rhetorical skills without an understanding of the theory on which such skills are based. The text combines thorough coverage of rhetorical criticism, media literacy, and strategic public speaking, providing a solid grounding in essential concepts while helping students hone their skills in each area.